The story wall went up at work today. We are the not just the only project running agile, we are the only project with much of a plan at all. Working in this small city has frustrated me to no end. People here talk of things they do, without doing them. They say they are aiming for this and that and then all the aiming that is done is in the talking of it. This project is different. We are walking the walk. The team likes the idea of agile. They are willing to try it. They are willing to find the flavour that suits them and the project. Our goals are simple. Short deadline. Fixed budget. Huge scope. When I joined, we had done a lot of requirements gathering and there were big solid specs being written. There were documents defining process and documents defining documents. 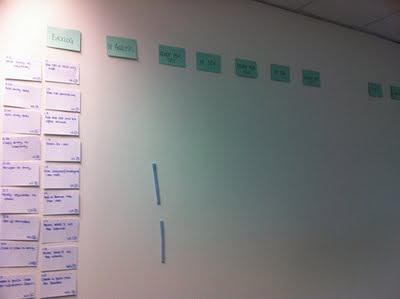 Today, I uploaded my last documentation of the project up to the Sharepoint portal and turned my head to the story wall. Over the last few weeks, we have been breaking down tasks. I walked them through how to do that breakdown and then how to guesstimate to the best of our knowledge at the time. We recorded effort in days and the whole team agreed on complexity and volatility. We came up with numbers and costs and best of all, a shared understanding of what we were building. The first visible way this has been communicated is to produce a story wall from our master story list. The master story list is a list of the discrete tasks that describe functions and sub-functions in the required system. Developers will undertake one task at a time, after business analysts have described it and they have both agreed on acceptance criteria. That acceptance criteria will guide our test driven approach to development and eventuate in automated tests and the QA and then user acceptance tests for each story/task/story. Sticky notes of random colours - These denote blockers and notes relevant to a story. They are stuck on the story card. There are columns that represent the stages a story, defect or technical card can move through. At each stage, there is an owner of that card. A card can not be in play and not have an owner. For a card to move from one stage to another, there must be a discussion between at least two members of the team and one must be the owner handing over to a new owner. Signed-Off - The users have tested it and the business has signed off the story as complete. We celebrate. For some that is chocolate. For others champagne. Every member of the team has chosen themselves an avatar that will represent them on the wall. Some chose their photos. Some chose creatures or characters that represent them. This is how they will be seen and how they will own their current task. These are about the size of a business card. Our only rule is "no nakedness". Every process is different. Every wall is different. The purpose is the same. Communicate and provide visibility to the whole team and stakeholders. Tomorrow, we will start holding our stand ups around the story wall. That is when the team will see the true value of both the visual story wall and stand ups. It will become the most important part of our project. It will grow and change so that it gives meaning to our particular project. Come back once in a while and check how we are progressing.